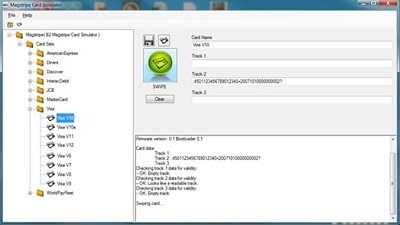 B2 Magstripe Card Simulator is a software application designed to simulate magnetic stripe cards without the need for an actual physical card. This tool can be used to replace hundreds of magnetic stripe cards required for testing and certification of payment card acceptance devices. The B2 Magstripe Card Simulator is a software testing application that emulates the real behavior of magstripe cards and eliminates the need for physical test cards. This tool can be used to replace hundreds of magnetic stripe cards required for testing and certification of payment card acceptance devices. The B2 Magstripe Card Simulator allows users to store XML images of all the physical test cards in one convenient place where they can be accessed by the B2 card simulator application. Simulation of all 3 tracks (Track 1, 2 and 3) of a physical magnetic stripe card. Load your physical magstripe cards into the B2 Magstripe Card Simulator using the magstripe reader provided. Edit and simulate card images using a user-friendly interface. Card images are stored as XML files. Includes some standard US processors test and user acceptance card definitions. Runs on Windows (7, 8, Visa and 10) and requires a USB port to connect the reader.